Balenciaga Releasing First Fragrance In 50 Years!! 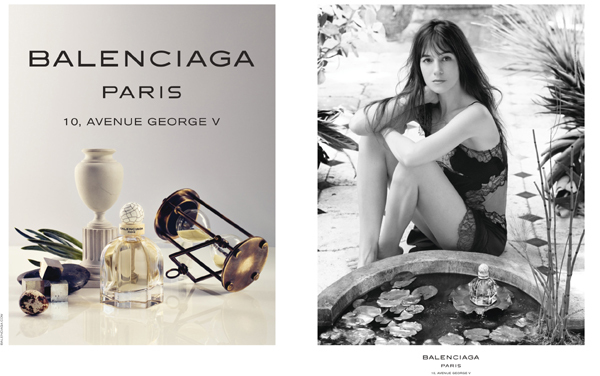 Balenciaga is finally expanding their brand into the fragrance market. Good job Gucci! I remember seeing fragrances from Balenciaga in the past, Le Dix (1947), Fleeting Moment (1948), Quadrille (1955), but now, there’s a new one, released by Nicholas Ghesquiere. I read an article where he was interviewed on his fragrance, but for some reason, he didn’t want to describe it, I guess he wants it to be a suprise, which is fine by me! I’m looking forward to smelling it! Its exclusively sold to and by Nieman Marcus, so when I’m in San Marcos, I’m going to be looking for the scent! Really exciting! The scent is called “Balenciaga.Paris” So I’ve read. What I found really interesting is that Nicholas Ghesquiere designed the fragrance’s bottle around the Balenciaga coined shape “the cocoon”, I love it, I think it’s great! I don’t think Cristobal Balenciaga could have done it better himself! I think the whole idea around the fragrance, the bottle, the ad, and the brand is a perfect marriage. What else is interesting, The spokes-model is Charlotte Gainsbourg,who’s mother is the woman the Birkin bag is named after!! So neat! If anyone gets a hold of the scent, tell me what it smells like, send a sample? This entry was posted in Uncategorized and tagged 2010, balenciaga, cristobal balenciaga, february, fleeting moment, le dix, nicholas ghesquiere. Charlotte Gainsbourg, quadrille. Bookmark the permalink.